CLICK HERE for our evaluation form. For employment information, please scroll to the bottom of this page. Would you like to send an encouraging note to a summer camper? Select the appropriate camp below and we'll make sure it's delivered. Please put your camper's name in the subject line! CLICK HERE for Google Map directions to Sacramento Camp. Everything you need to know to have the best experience at Sacramento. Event planners will find everything they need to plan the perfect event, and attendees will discover what's offered while visiting. This is your key to entry to all the fun you will have at Sacramento. This policy helps us maintain a safe environment for everyone. Child safety comes first at Sacramento. 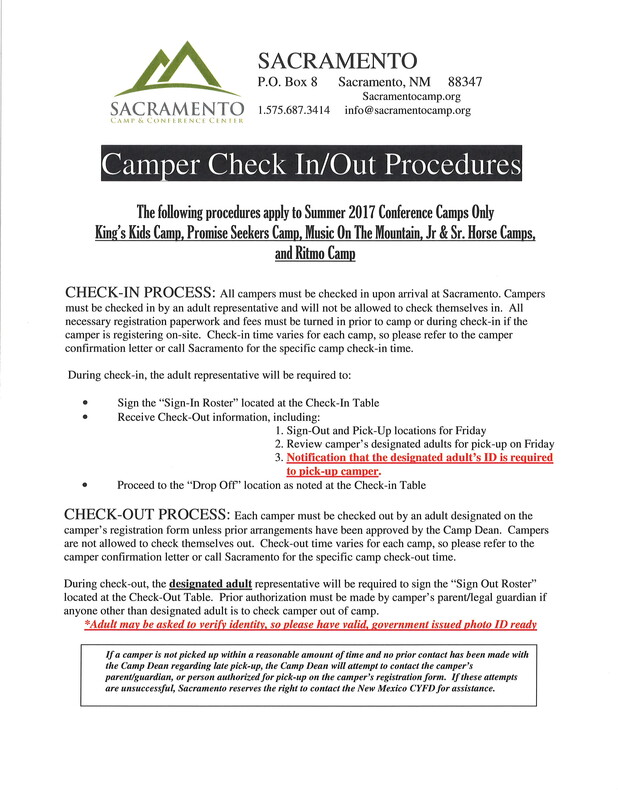 If you are a camper parent or guardian, youth leader, or an adult volunteer at camp, be sure to review these important policies and procedures. If you are interested in a rewarding and challenging summer job, consider summer employment at Sacramento! Interviews usually start in January and we try to have the positions filled by Spring Break. Competitive salaries plus room and board are offered. Summer staff must be available from June 1, through August 10. Duties may include housekeeping, kitchen crew, trail-blazing, grounds maintenance, building maintenance and/or renovation, assisting volunteer work crews, snack & gift shop staffing - and, above all, the willingness to do whatever it takes to meet the needs of our campers! This is a ministry as well as a service opportunity! Thanks for your interest!